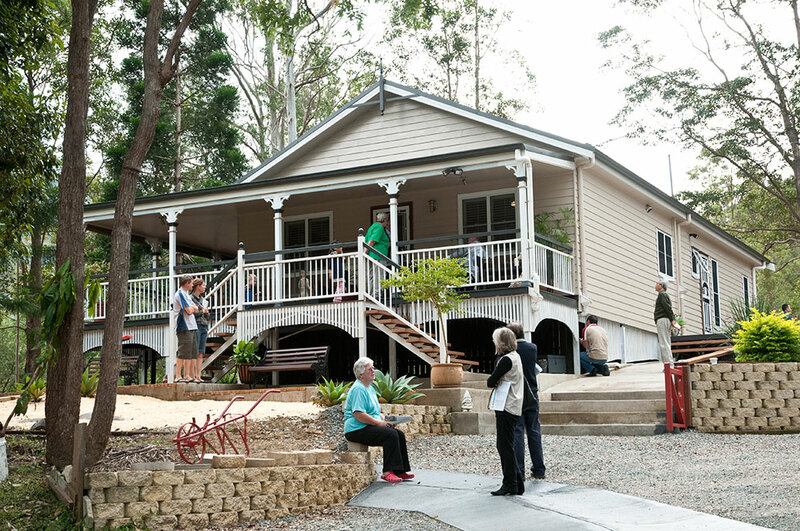 A recent Open House held by Paal Kit Homes at Cedar Creek, Queensland, saw people come from afar to view the home built by retired plumber Brian Hart and his wife Cheryl. This beautifully presented residence attracted a lot of favourable comments from the numerous visitors. “Our driveway was congested with cars. People were so talkative and wouldn’t leave! Some were here for hours, and a few even went away and came back later,” Brian said. The Harts built a traditional Queenslander based on Paal’s Kiama design, with modifications that included an enlarged verandah and a double set of steps in front. Cheryl has design talents and created many of the home’s beautiful finishes, both inside and outside. Brian employed carpenter friends to give him a hand with construction, all of them wood chippies who hadn’t worked with a steel frame. “They loved the way it all fitted together and said it was millimetre-perfect. Looking along the frame at ground level, they found it to be as straight as a gun barrel. Brian didn’t need the plumbing and electrical inclusions in the kit, as his mates provided those. He also substituted non-standard architraves and skirtings. And Paal upgraded his own choice of plasterboard. “Paal went along with all our changes to the kit. They were flexible and easy to deal with. Our motto for Paal homes is – You’re Only Limited By Your Imagination,” he said. “They gave us plenty of backup. If we weren’t sure about something, we just rang them. They were always very helpful.